I have attended over 20 NeoCon events plus multiple industry conferences over my career, all within the borders of the US. When offered the opportunity to travel to the September 2018 edition in Shanghai, I jumped at the chance. One can not accurately capture the size, scale and breadth of the show as experienced in-person. Originally conceived as the primary showcase for the China furniture industry, starting in 1998, it has evolved over the past several years as the primary vehicle to showcase the furniture industry for both residential and contract markets in China and the APAC region. Whereas there has historically been a perception that these shows exhibit an abundance of “knock-off” offerings, the emergence of a robust design community and efforts to create original product offerings now yield a show robustly presenting the depth and breadth of the current state of furniture design and manufacturing in the region. The show, organized by the China Foreign Trade Exhibition General Corporation, this year adds co-sponsorship, and participation from Red Star Macalline Group Corporation Ltd., a company that operates and manages home improvement and furnishings shopping malls. Under the Red Star Macalline brand name. It is estimated as of late 2017, their portfolio includes 256 shopping malls, offering approximately 20,000 brands across 177 cities in 29 provinces, municipalities, and autonomous regions in the People’s Republic of China. The Shanghai venue is the National Exhibition & Convention Center, in the Hongqiao district of Shanghai. Sheer size and Described as the world’s largest exhibition venue, I do not doubt that it meets that description. It took our bus about twenty minutes to circumvent the building to place us at the drop off to the main show entrance. Configured in a four-petal configuration with concentric circulation both vehicular and pedestrian, a map in hand was a constant necessity. Fortunately, color-coded way finding made it easier to find the pavilions and bi-lingual signage was essential. For comparison to Chicago’s Merchandise Mart, and equally imposing building, I kept wondering how many Merchandise Mart’s would fit in this location! A few caveats about our coverage. The show is most definitely geared to buyers from the wholesale market, both domestic and international. There were limited opportunities to converse with exhibitors due to the language barrier, almost universally, flashing my media credentials yielded an entry to the manufacturer’s booth, but no option to find out more about the product. Conversely, this was almost freeing, in that my observations and impressions are woven into a story based on what I saw relative to the design, materials, quality, and presentation based solely on my own experience. I think this is important because the world is getting much smaller and the global influences on design are much more prevalent on the market(s) here in the US. As more businesses operate on the international stage, and design firms are not necessarily limited to do work in their home cities and countries, it is imperative that we become more informed by what is going on outside our borders. The kick-off banquet on Sunday evening included the awards for the best in design, The Pinnacle Awards Asia-Pacific, an awards program that is a joint effort of CIFF and the American Society of Furniture Designers (ASFD) and the High Point Furniture Market. The winning products and manufacturers are prominently featured throughout the show. As the only international furniture and home furnishing design award in the region, this moves the ball forward to put these products and manufacturers in the global spotlight. Additionally, there were a few exhibitions, within the larger event, notably the “Design Dream Show” and the East Design Show and Chinese Design Trends, which promulgates the notion that “good design is good business.” These events, geared to promoting and heralding the development of Chinese design, presenting them at CIFF Shanghai demonstrates the continued importance of this event for the Chinese the furniture design, manufacturing, and retailing community. It gives international attendees a broad overview of product design and development in this critical global market. Entering the exhibition center transports you into a whirling vortex of people heading to the various pavilions. With an estimated 200,000 attendees spread over the breadth of the hall NECC’s 400,000 m² (4.3M SF), plus the daily population of adjacent office buildings you are in a hive of activity. We think the relevance of this exhibition to our readers is to get a glimpse of what is happening globally. Regardless of all the political drama and potential trade issues – it is essential to view this from the perspective of furniture design and markets outside of our geographical comfort zone. It is this writer’s opinion that it would be naïve to think that the expanding development of China’s furniture industry and concerted effort to promote better design and manufacturing techniques will not have an impact worldwide. Although there was a smattering of manufacturers from Europe and other parts of the APAC region, the show is most decidedly geared to the Chinese market. Most of the attendees represent high-end exhibitors, designers and major retailers from 29 provinces and 182 cities from all over China. However, there is no doubt that the furniture exhibited here will find one way, or another will be delivered and installed well beyond China’s borders. Another over-riding observation is that the exhibit shows the influence of design outside the region on the product(s) are designed and manufactured in China and the APAC region. All things considered as the world gets smaller due to better transportation, communication, and flow of people from one continent to another, design concepts are more easily transferred from one culture to another. So, what did we see and how do we think that will impact workplace design? In the Office Furniture Pavilion – there was considerable emphasis on ergonomics and creating furniture to enhance wellness in the workplace. Solutions ranged from increasing technology to have adjustable work surfaces, lighting, and connectivity. There were many vendors for storage lockers used significantly in co-working and free address workspaces. Multiple booths were showing updated furniture technology, locking mechanisms, sit to stand table bases, both manual and powered. It would be interesting to tabulate how many chairs were on display. Task chairs took the lead regarding quantity, variety, colors, material, features, ergonomics, technology, comfort and price points. Exhibits ranged from sophisticated multi-level pavilions to small perimeter booths showing an array of parts and pieces to assemble any kind of seating. As the “devil is in the details” there was apparent effort to differentiate product by changing out materials and construction styles. While many may have alluded to previously designed US and European product, most manufacturers exhibiting product made significant efforts to create something different. Notable features were chair back, and arm details. While there are themes that are recurrent in the larger world of furniture design, there were very few products that were poor copies of more well-established designs, and the quality of most of the products was considerably higher than I expected. I imagine all price points are available, although I was limited in the amount of concrete pricing information I could get on many items to compare, for example to the US market. What about wellbeing in the workplace? 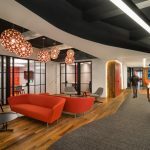 While the plethora of seating options focused on comfort and ergonomic features, there also was an emphasis on other furnishings to support a healthy workplace. Just as at NeoCon, there were multiple iterations of adjustable height tables and desks. Many exhibits featured the technology components for providing sit- to -stand solutions. One exhibitor, TiMotion recently featured in WDM, had a very active display area. It was nice to see a familiar “face” in the crowd! One exciting display offered options for multitasking work/exercise options. A unique feature of these options was that they utilized natural materials in their design and construction. The exhibit promoted the marriage of nature and technology in presenting their products. Bike and treadmills were spare; clean takes on more elaborate workplace fitness options. Another differentiator, this show from others, attended was the elaborate set up of the manufacturer booths. While most trade shows feature pipe and drape 10 x 10 stalls, there was a wide variety of presentation mini-pavilions within the exhibit halls. While some smaller companies had small presentation areas around the perimeter, front and center were large, elaborate mini-showrooms that were fully enclosed islands within the larger space, and featured quite an elaborate lighting and architectural features. These exhibits provided a distinct background and conveyed subliminal “brand” messaging in many ways. The exhibits went from amusing…to zen! The merger of work and life concerning furnishing workspace was apparent throughout each pavilion. The ancillary product was front and center, similarly to what we have seen at other recent furniture shows. Soft seating and “collaborative” spaces were featured in many exhibits and greatly outnumbered more traditional workplace furnishings. Providing for the more open and multi-purpose places that are currently in vogue were the story of the day. I think it was more about what we didn’t see! What seemed to be absent were the ubiquitous “phone booths” that popped up everywhere at this year’s NeoCon. I only saw one or two examples of system furniture solutions. Most of the displays were based on the premise that keeping things loose and flexible is the way of the future for contract furniture solutions. The office furniture pavilion did not feature many exhibits with other architectural products like flooring, wall covering or upholstery textiles. Although those are an integral part of product introductions at NeoCon, they were not featured here. The majority of the pavilions featured residential products and related décor so that those items may have been more evident in those displays. Conventional office furnishings were also in short supply, yet the few that I saw, had an elegance and simplicity of detail that was quite striking. Several “fun” displays showed a streak of humor amid the seriousness of the occasion. The exhibitors were there to show off their product, and the buyers were there to buy yet the visual relief offered gave the show a sense of festiveness that softened the vastness of the venue and the intensity of the crowd(s). I loved the bubble walls! The key takeaways for me were that there is a burgeoning creative community within the Chinese furniture market, most likely driven by the desire for more variety and quality consumer goods. Just taking in the huge office and residential complexes that serve the 24 million + population of Shanghai would indicate that there is a built-in demand for both contract and residential furniture. Multiply that by the rest of the region, and there is most definitely a relationship between the size and scope of the show related to the potential market out there that will need the goods and services showcased. The multi-day event was an exercise in furniture overload, yet it offered a view of a world unlike any I had ever experienced. As a first-time visitor, I truly appreciated the opportunity to see furniture and design from the viewpoint of another culture and environment. No doubt this show will continue to evolve as the design and furniture industry evolves in this geography. After this incredible introduction to CIFF – we are looking ahead to spring in Guangzhou.